Dr. Chun-Pin Lin is a distinguished alumnus of the School of Dentistry where he earned a doctorate in oral biology and the College of Science and Engineering where he earned a master of science in biophysical science, while maintaining a perfect grade-point average. 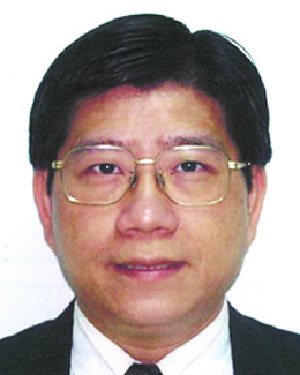 He trained as an expert microscopist, which was the catalyst for his rise through the ranks of academic and clinical dentistry, both in Taiwan and internationally. With equal intensity and success he has pursued parallel fields of biomechanical studies, clinical service, and administrative services. Today, he is chief endodontist, professor, and dean of the Dental School of National Taiwan University, and chief opinion leader in the international arena. Dr. Lin has held many leadership positions in both the research and clinical realms of dental and medical fields. However, it is not only these leadership positions that are impressive but also the innovations he has established. As president of the Academy of Endodontology of Taiwan, he solidifed the criteria for examination and evaluation that led to the accreditation of endodontology as an individual specialty. In 2000, he became secretary of medical affairs at the National Taiwan University Hospital, where he had oversight of both medical and dental affairs. He also initiated and established the center for Medical Quality and became the center’s first director. Dr. Lin’s enthusiasm in education was a driver in one of his greatest contributions to the dental field in Taiwan when he re-established the School of Dentistry at National Taiwan University Hospital as an integrated institute independent of the College of Medicine. He was elected both the dean of the school and director of the Department of Dentistry. This greatly helped establish a comprehensive dental training and clinical system with a more controlled quality of care that could not be achieved prior to this development. Dr. Lin is also a highly renowned scholar with many contributions to research scholarship. He led the most prominent Taiwanese dental research journal, the Journal of Dental Science, to encourage distribution of fundamental knowledge. His leadership role in the research arena is evident through many of the awards he has accumulated over the years that are rarely awarded to work in the field of dentistry. As the recipient of these prestigious awards, Dr. Lin has opened the field of dental research to new possibilities and higher standards. His natural leadership qualities have led to other international activities in research including serving as his country’s administrator for the International Association for Dental Research – Southeast Asia, which is the largest international dental research community. He has also hosted and chaired some of the largest international conferences including the Asia-Pacific Endodontics Conference. In naming Dr. Lin as a recipient of the Distinguished Leadership Award for Internationals, the selection committee cited his ongoing international presence, influence, and leadership in his field. The committee was struck by Dr. Lin’s energy and his ability to excel in so many different roles. He is committed to supporting the next generation of academic dentists as well as bridging the gaps between experts and patients.